Stuart "Easy Pickings" Rutter burst onto the poker scene at the tender age of 22 by qualifying for the Monte Carlo Millions and followed this up by making the Final Table at the Helsinki Main Event. Now a student in Germany, Stuart continues to tell UK Poker News about his journeys to the poker rooms of the UK and Europe, including an exciting tournament against some of the best players in the UK at his home casino in Walsall. After travelling across Europe from Germany in search of poker tournaments, the journey down the M6 to Walsall seemed remarkably short. The Grosvenor organise poker festivals on a level above all others, and an action packed week drew massive crowds to the Midlands Medley Festival. The only disappointed ones were those turned away on Wednesday and Thursday, due to a 180-strong full house. Tuesday was my first experience of a big money (£200) rebuy event, but fears of a call from the bank manager were allayed as the action was far tighter than Walsall's usual rebuy mania. I felt contented with my starting table, until Stuart Fox and Monte Carlo Millions runner-up Paul Jackson filled the two remaining seats! My feeling about playing against very strong players is that, to play timidly against them is to play right into their hands, so I tried to treat them as just another stack of chips. Everyone would start with 3,500 chips, with ninety minutes for the lady with the rebuy chips to scurry between the tables. I got off to an unusually active start, bluffing, hitting some scary boards, and being faced with a lot of aggression. My KJ hit a lovely flop of KJ4, and a blank 3 hit on the turn. The 4 on the river seemed a reasonably safe card, until my opponent made a big overbet of the pot. Faced with my first big decision, to either double through or be the first shouting "chips", I was at first inclined to give my opponent credit for trip fours. It didn't quite seem to fit, however, so I called and was relieved to see him turn over a busted flush. I went into the break with a stack of 9,000, but was disappointed with what might have been. 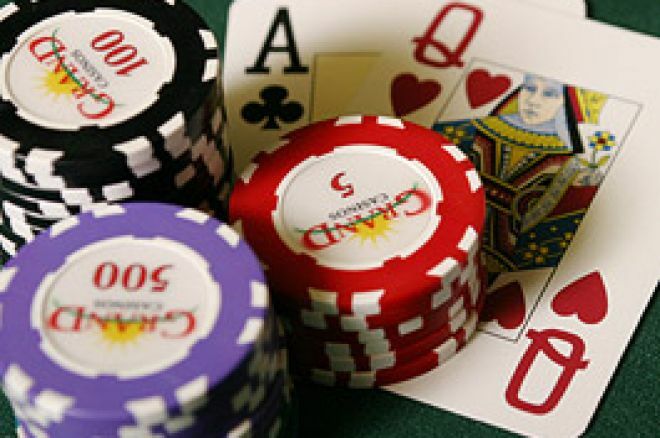 Having passed a pair of sixes to a raise before the flop, a 6 high flop was not a pleasant sight, nor 10,000 chips going into a multi-way pot on the flop. However, such an important part of the game is to focus entirely on what is to come, not what has or could have been. The great structure meant the blinds were still small compared to the topped-up stacks, and there was going to be a lot of action to come. A pair of kings gathered a few more chips, and I went with 16,000 chips to a corner table seating a couple more local gents. Unfortunately, their names were Marc Goodwin, third in the Monte Carlo Millions, and Mickey "The Legend" Wernick, top of the charts in Europe last year! The one chink in the armour of the big guns is that they loathe calling all-in for their tournaments' lives, so I nervously attacked Mickey's short stack. The next arrival at the table came accompanied by whole team of chip carriers. Holder of a World Series bracelet from last year's $2,000 Hold'em event, Lawrence Gosney had been given the ammunition of 180,000 chips, nearly one third of the total in the game. The fact that there were still forty runners left made this astounding. More remarkable was that, forty-five minutes later, he would be walking out of the casino door! At first, what was a small dent in his stack was a massive boost for me, as my semi-bluff with AJ of spades on a flop of T88 with two spades was caught. Lawrence did well to raise all-in with T6, and too much was in the pot for me to pass. A turned spade saved my tournament life. Four further times, Gosney got his chips in as a favourite, and amazingly was outdrawn each time. It was a real lesson to see his temperament never change after a spell that would have sent lesser players over the edge. I always feel that the crucial time of any tournament is when about 25 or 30 runners remain. The pressure of poker is at its greatest, as one decision will make the difference between a penniless exit and a trip to the final table. This spell arrived at about three in the morning, and I found it tough going to keep up my concentration. In a crucial battle between the blinds, my AK looked good on a flop of A97, but a check-raise from my opponent put me to the test. He had seemed to be weak before the flop, so 79 seemed the worst case scenario, and I would have outs to this. I put all my chips in, and the heart raced for two full minutes before my opponent threw his cards in. With the final nine edging closer, I decided to change old habits and attack. In this situation, I feel that the upper hand is with the player who can give the other a decision for all his chips. However, the foolish one was once again me, as I tried to pressurise my opponent's late position raise with a miserable T6. A ten high flop gave me a decision I didn't want to have, and I didn't get away from doubling up my opponent with two jacks. I recovered some chips, and a mixture of tiredness and elation greeted the fact that five o'clock had come, and thirteen of us would be coming back the next day. I came back the next afternoon with 90,000 chips, just a little above average. A few more heartbeats were missed as I put all my chips in the big blind with AK to a raise from the small blind, Tom McQueenie. He passed, and mercifully it was not long until the unfortunate four had been knocked out, and we were drawing for the final table. The "Mad Turk," Yucel Eminoglu, Marc Goodwin and Ali Mallu were the names to fear, and all brought stacks of above the average 95,000. A trademark mis-timed move soon got me down to 60,000 chips. These all went in on a flop of KJ7. I held AK, and was relived to see that Ali Mallu had re-raised me all in with just middle pair. Soon, a KK vs QQ confrontation would put Mad Turk out and make Marc Goodwin even more dangerous with over 200,000 chips. It almost seemed unfair that such a good player would then flop a set on two consecutive hands. Firstly, a flop of T87, with two hearts, gave Ian Fieldhouse a massive draw, with A9 hearts. He had many outs even against Goodwin's three tens, but a paired board put an end to Ian's brave and accomplished performance, and he was out in fifth. Ali Mallu then thought his 85 in the small blind had hit a good flop of 762, but he was beaten to the middle by Marc Goodwin, who had made a set of twos. No four or nine arrived, and just three remained. My sense of reality had long gone; I found myself in a situation I had imagined I would never be in. I had a strange sense of calmness, and for the first time felt myself playing under no pressure. Still a student, and in awe of my opponents, I would still be elated if I was knocked out now and collected third prize. In the first family pot between the three of us, I held 96 of hearts, and down came a massive flop of A87, with two hearts. My plan to check-raise the big draw fell flat as the hand was checked round; however, a beautiful ten of spades fell next. Tom McQueenie came out betting, I wasted no time in re-raising, nor he putting all his chips in. He had AT, top two pair, and a wonderful blank deuce came on the river. My heart raced as I shook his hand and realised I would be playing against Marc Goodwin heads up. It felt great to be getting a result for the Brummie Bandits, who had come over from the big cash game to support. My brother and I exchanged a glance, and we both knew what the other was thinking. I would probably be collecting second prize, and had the chance to play against a local hero. Equally, in poker, every man has the right to take his shot, so I went in trying to feel confident. The two chip stacks would be almost exactly even. A few small pots started the proceedings, which Marc got the better of, before the pot that would decide the contest arrived. I had been aggressive from the small blind, and was re-raised to 60,000, having raised with AQ. I thought for just a couple of seconds, before shoving all my further 310,000 chips into the middle. My aim was to try to make Marc have to gamble, knowing he would much prefer to chip away at small pots against me. He thought for a while, making me think I might face a coin flip, but when he did call, showed AT. I was in good shape, but felt a sense of "Que Sera Sera". I would be happy to lose having gone in as a favourite, and any chance of feeling disappointment was long gone. First card king, second a killer ten, and the next card came a jack! I could not believe my eyes. There were no more shocks after that, and we counted out the chips to see whether it was over. Unfortunately not; Marc still had 55,000 chips. However, with a 10,000 big blind, he would be forced to put them all in. He did so a couple of times, before I eventually had an easy call with AT. An ace came down second card, and I had done it. I sat back stunned, feeling in equal measure exhaustion, joy and disbelief. I celebrated with the Bandits over a couple of drinks - one for the first big victory and one for the last - but there wasn't much time to spare until the next twists and turns in Wednesday's £300 Freezeout.